This article is about the item that appears in Super Mario Bros. 2. For the inspired item that appears in Super Mario 3D World and Captain Toad: Treasure Tracker, see Double Cherry. Two cherries connected by two stems and a leaf. When Mario, Luigi, Princess Peach, or Toad collects five Cherries, an invincibility-granting Starman floats from the ground. A Cherry is a special item found in Super Mario Bros. 2. When Mario, Luigi, Peach, or Toad collects five Cherries, an invincibility-granting Starman floats from the ground. Cherries appear in abundance in Subcon, and many can be found in every level. In the GBA remake, the character will say "Lucky!" each time one is collected, and a chime will play upon grabbing every fifth one. They also appear in the slot machines of the same game. When a player lines up even one of them, they receive extra lives (a 1-Up for one in the first slot, 2-Up if the first two slots have cherries, and 5-Up for all three; this is changed to a 3-Up maximum in the remakes). Cherries make a minor appearance in Yoshi, after the player clears levels 19 through 21 of the B-Type game, rewarding the player 900 points. 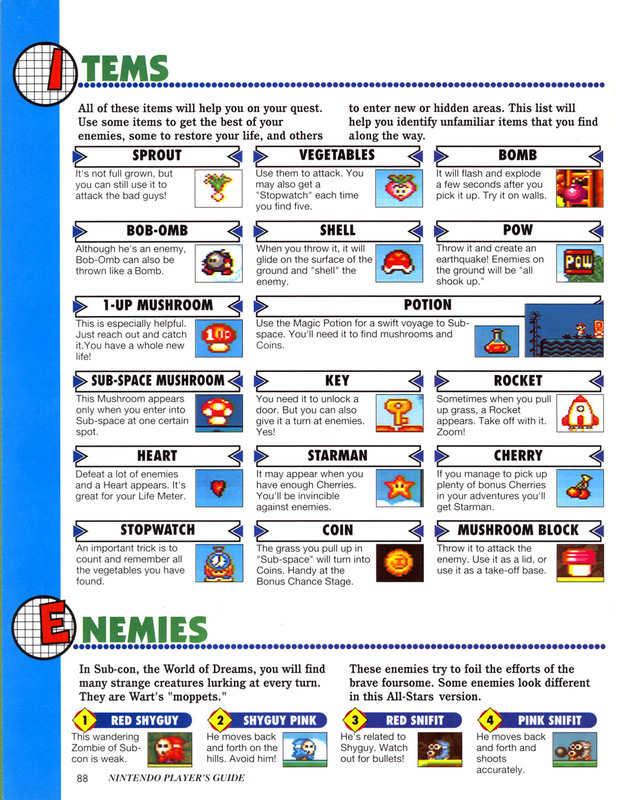 ↑ Super Mario Bros. 2 instruction booklet, page 21. ↑ Super Mario All-Stars Nintendo Player's Guide. Page 88. This page was last edited on January 20, 2019, at 15:04.